Rhododendrons in good soil do not usually require supplemental watering except when they are first planted, in time of drought, or in late fall before the ground freezes for the winter. If they are planted in healthy soil with lots of organic matter in it to hold moisture and are mulched, established shrubs can manage fine with normal rainfall. Because their roots are so shallow, even well-established shrubs need watering during a drought. Provide 1 gallon of water to each rhododendron twice a week, from a drip system or sprinkler for 20 minutes twice a week. Keep rhododendrons mulched year round to retard evaporation of moisture from the soil. Well established rhododendrons growing in healthy soil that has lots of organic matter in it do not need to be fed unless they are not growing from 4 to 6 inches a year. In this case, feed them once a year. In either the fall or early spring sprinkle a handful or two of a slow-acting granular fertilizer designed for acid-loving plants on the soil at the base of each shrub. Spread it out to 1-1/2 feet beyond the tips of the branches for the rain to water into the soil. If you mulch consistently the soil will improve over the years and you will not have to fertilize as often. 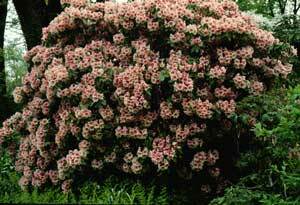 A layer of organic mulch at the base of each rhododendron will keep the soil moist and control weeds. It also harbors lots of beneficial organisms and conditions the soil as it decomposes. 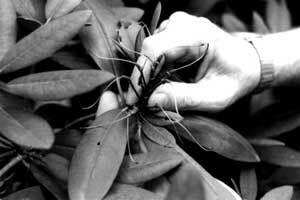 Spread a 2 to 4 inch layer of some attractive organic material such as chopped (not whole) leaves, pine needles or wood chips on the soil over the rhododendron roots in a circle out to the branch tips. Leave the mulch on year round, renewing it periodically as it decomposes. In the winter it will insulate the soil around the rhododendrons, protecting them from fluctuating winter temperatures that may cause the soil to heave and disturb the shrub's root system. While rhododendrons do not require pruning, they benefit from grooming. To encourage the best bloom the following year, remove the flower heads after the plants have finished blooming, before the seeds form. Pinch or snip off with pruners old bloom clusters, cutting back branches only as far as a bud or small shoot. If there are no rosettes of leaves from which a new bud or shoot can sprout, cut the entire branch off. Immediately after bloom is also the best time to take out weak and dead branches, and to cut old ones back lightly to make a well-shaped shrub. When pruning to encourage compactness, snip off the small terminal leaf buds, not the larger blossom buds. Do not shear rhododendrons with hedge clippers. Renovate and revitalize overgrown or aged rhododendrons with major pruning. After they bloom, cut back all main stems severely, possibly to within 6 or 8 inches of the crown of the shrub at soil level. This will stimulate sprouting of new stems. An alternative is to renovate gradually by removing about one-third of the old, thick branches each year after they bloom. While rhododendrons can withstand cold winters, their broad leaves often take a beating from wind and bright sun. Leaves dry out and become brittle, easily punctured as wind blows them against each other. Spray shrub foliage in the fall with an anti-transpirant, thoroughly coating all leaf surfaces to protect them. This will help the shrub to retain moisture. Repeat this spray on a mild mid-winter day, when the temperature sneaks above 40° F. If shrubs are located where they are exposed to severe winds, consider erecting a windbreak of burlap, or similar fabric available at garden centers for this purpose. Never wrap a shrub with plastic or any other material that prevents air circulation around it.